Four ensigns deal with crew evaluations, compete for a promotion, and try to figure out what is happening while the ship engages in a mysterious mission near the Cardassian border that ultimately costs one of their lives. And it's another weak hook at the beginning. I hate to keep carping on this, but is the audience really supposed to stay tuned to find out which of these two ensigns we don't really know is going to get a promotion? Trying to watch this episode from Picard's point of view, especially in the context of "Chain of Command, Part II," is fascinating. I'm not saying I wish the story was from Picard's perspective--I absolutely love what this episode is doing instead--but consider that Picard knows all too well what he is asking Ensign Sito to face. When he dresses her down in his ready room, he is very gently prodding her to see if she can take the kind of psychological torment the Cardassians can inflict. Indeed, a lot of his dialogue--"Well I'm sorry you didn't enjoy your time at the Academy, Ensign"--sounds more like Gul Madred than Captain Picard. It's not easy to lie to a Vulcan, as La Forge learns in the shuttle bay. 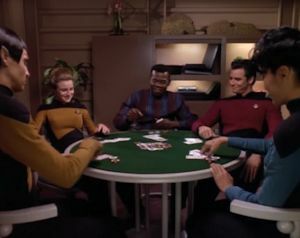 As for playing poker with a Vulcan, it's a mixed bag. On one hand, he'd probably see through your bluffs every time, but on the other, I don't think he'd be able to bluff either. Of course, Vulcans spend their entire lives with the same poker face. The scene where Worf gives Sito the "Gik'tal Challenge" shows a side of his character that I absolutely love. "Perhaps next time you are judged unfairly, it will not take so many bruises for you to protest." I'm such a sucker for Klingon wisdom. This is a vast improvement over the last couple of episodes. The writers are still playing around with the TNG formula to find something unique, and it works to great effect here. It's a puzzle show, in that you have no idea what the mission is until near the end, but it's also a deep character study of characters who, for the most part, you've never seen before. Also, like "Data's Day," this is an exploration of the Enterprise itself, showing us a slice of life aboard the ship we haven't seen before. Subtextually, the narrative is exploring how the universe--even the most familiar areas--is full of stories so numerous and complex that you can never experience them all. Almost all of the action occurs off-screen: the Cardassian's arrival, Nurse Ogawa's engagement to Lieutenant Powell (who is never seen in the episode), Sito's death, and Lavelle's promotion. Additionally, you can look at a lot of the conflict in the story as being driven by how difficult it can be to understand the experiences of others and how hard it is to get passed preconceptions. Each of the four ensigns learns this lesson. Taurik, by revealing that he sees through La Forge's pretense, worries that he has damaged his relationship to the Chief Engineer, but La Forge surprises him by going to him for help, showing that La Forge respects the Vulcan's intelligence. Nurse Ogawa is having trouble understanding what it means that her boyfriend is preoccupied (and Dr. Crusher gets nervous because she sees Lieutenant Powell talking to another woman), but then it is revealed that Powell is only preoccupied because he is preparing to ask Ogawa to marry him. Lavelle thinks Riker hates him--which is actually sort-of true--but he doesn't realize that Riker is able to put duty above personality and values the advice of those around him (who are, without Lavelle's knowledge, defending him). Finally, there's Sito, who's preconceptions about Picard after he dresses her down are best expressed by the line, "It's not your place to judge me for what I did at the Academy. I've worked hard here. My record is exemplary. If you're going to judge me, judge me for what I am now," which not only states the theme right out but also reflects Picard's attitude towards Q in "Encounter at Farpoint." Sito learns that she was wrong about Picard, but she also learns the lesson again. While on the shuttlecraft with the Cardassian spy, she presses him to understand why he would help the Federation. She says she never thought a Cardassian would talk about being tired of war, and the Cardassian replies that he never thought a Bajoran would risk her life to help a Cardassian get home. These characters have finally learned that preconceptions can be misleading, and that's one of the core ideas of Star Trek. The dueling poker games serve as the ultimate metaphor, showing how these characters are all essentially the same, but still confused by interpersonal relationships, bluffs, and incomplete information. Finally, it's not a coincidence that the entire episode is driven by crew evaluations, the need for senior officers to judge their juniors. Of course, it's also an episode about the nature of duty. Each of the ensigns is learning a lesson here about the weight and importance of duty, culminating in Sito's ultimate sacrifice in the end. When Lavelle presses Taurik and Ogawa for information they can't give, he barely represses his annoyance, but when he learns of Sito's death--and later, when he finally gets the promotion that he's wanted the whole episode--he understands that duty means a lot more than he thought it did. The character of Ben, the gossiping barman, demonstrates this too. He makes it clear that he's not Starfleet, that he is not tied to duty the way the rest of the crew is, and thus he is free to engage in gossip and recreation. He isn't a bad person, though, as he demonstrates at the end by encouraging Worf to sit with the junior officers and talk about Sito; he simply shows the kinds of attitudes that the junior officers have to overcome in order to be officer material. "Lower Decks" is one of the most thematically dense episodes in TNG's entire run, and though it lacks action and sci-fi, it is easily one of the most poignant and emotional stories you'll find, demonstrating that, despite the last few episodes, the writers of TNG are still capable of greatness. Apparently, there was a DS9 story idea floating around the writers room that had Sito returning, but it never came into fruition, the idea eventually mutating into "Hard Time."